The statement by Nils Muiznieks, Council of Europe Commissioner for Human Rights. 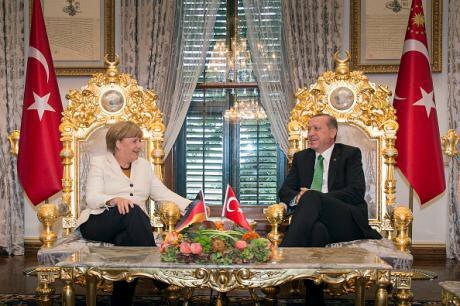 German Chancellor Angela Merkel visits Turkey. Getty images/ Guido Bergmann/Bundesregierung. All rights reserved. Strasbourg, 21 March 2016 - Now that the EU Turkey deal has been reached, the utmost care should be given to its implementation in order to dispel a number of serious concerns that the deal elicits from a human rights perspective. It is positive that the agreement contains some legal safeguards, such as the adherence to international and European laws. This should prevent automatic collective returns and offer an objective assessment to each individual requesting asylum or international protection. At the same time, in order for the deal to effectively comply with human rights law, the EU, Greece and Turkey have to ensure that additional principles guide its implementation. First of all the deal and its legal safeguards should apply not only to Syrians, but to all people reaching Greece or any other EU country. Secondly, the EU and its member states have to provide urgent help to Greece, whose dysfunctional asylum system has led to violations of migrants’ human rights, in particular as regards reception conditions and access to asylum. This help should take the form of financial and human resources, but also that of a strengthened relocation of refugees within the EU. The current places available are clearly insufficient and the number of refugees relocated is utterly inadequate. An additional element is that both Greece and Turkey limit the use of detention of migrants only to exceptional cases, because irregular entry and stay in a country is not a crime. Special attention should be given to particularly vulnerable people, such as children, pregnant women, and victims of trafficking and torture. It is also crucial that Turkey applies legal and procedural safeguards to all migrants –not only Syrians – who return from Greece. This includes the prohibitions of refoulement and collective returns. It would be an illusion to believe that both migrants’ suffering and the pressure on European countries would disappear thanks to this deal. It is just a patch to plug one of the holes in the highly dysfunctional approach of European states to migration. Bolder, long-term measures are needed. It is urgent to increase legal and safe opportunities for refugees to seek protection in Europe, such as more resettlement opportunities – not only from Turkey – and eased humanitarian visas and family reunification rules. To this end, the UNHCR conference in Geneva at the end of March is an opportunity which should be seized. Moreover, laws that ensure a humane approach to the needs of migrants should replace provisions that criminalise those who enter and remain by irregular means. EU search-and-rescue operations in the Mediterranean should also be strengthened. Finally, political leaders and opinion makers should confront public anxiety about migration and asylum from a principled standpoint. They should lead the way by adhering to human rights standards and the moral principles of tolerance, acceptance and solidarity which define Europe. Protecting refugees is both a moral and a legal obligation. It is not an easy task, but nor is it impossible. The EU-Turkey agreement may be part of the solution but European countries must do more to protect those who flee wars and persecution.